Just 15 minutes drive from Faleolo Airport, escape to the tranquil seclusion of Ifiele’ele Plantation – top-class holiday accommodation Samoa. Indulge your senses, restore your soul and delight in the charms of Samoa. Nestled amongst tropical fruit trees and with views of the azure waters of the Pacific Ocean, Ifiele’ele is the perfect place to relax and reinvigorate the senses. With its luxurious, private, self-catering holiday accommodation, Ifiele’ele is ideal for a honey-moon, romantic interlude, family holiday, friends’ re-union, health retreat, business travel or secluded solo inspirational getaway. 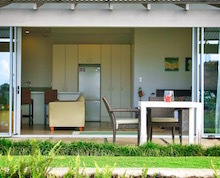 Ifiele’ele offers all the mod cons including spacious bedrooms, deluxe bathrooms and wireless internet so you stay connected to the outside world without having to leave your luxury villa. At Ifiele’ele you can escape the madding crowds of hotel holiday makers in your own private plantation. Ifiele’ele is professionally managed by two hosts who have themselves travelled to the far corners of the world. They have settled in Samoa to combine their passion for the island with five star hospitality and provide a unique experience – for those wishing to experience the true Samoa. Your hosts can provide information on everything from supermarkets to snorkeling, car hire, shopping, restaurants, best beaches and the glorious sunsets. 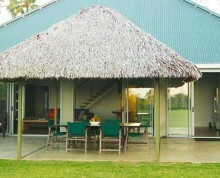 For those who prefer catered accommodation, meals can be provided by arrangement. Relax, take a breath and gaze out to sea. Let time stop in your own private oasis. A spacious, modern 2 or 3 double bedroom and 2 bathroom home with stylish indoor and outdoor living spaces and views to the Pacific Ocean. A completely self-contained apartment with full-sized kitchen and bathroom, generous indoor and outdoor living areas and fabulous sea and plantation views. 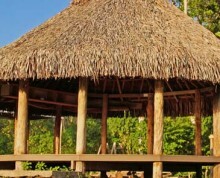 For those who may want to get closer to nature or experience part of Samoan culture, a traditional Samoan fale is also available with its own facilities.